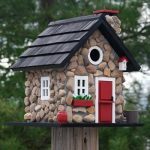 Spring Fixups – Caring for Your Home’s Exterior and Yard - D4 Construction Inc.
Spring is truly the time of new awakenings and restoration. 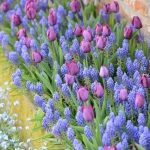 Just take a look at the flowers beginning to blossom in your yard and garden. Your house often needs restoration, as well, after a winter when windows have been locked up tight and severe weather may have battered your home for months. Cleaning is one thing – restoration is another. They both need to be done this time of year to keep your house in its best shape. Next month we’ll tackle the projects you’ll need to accomplish to not only clean the inside of your home but fix those things that have been neglected inside. But this month we’re concentrating on cleanups and fixups outside your home. Roof and Chimney – After a long hard winter, or just another year gone by, your roof may show smaller problems that can be fixed now to avoid an emergency later. You may want to take a look in your attic first to see if there is any evidence of water damage that might point to a leak in your roof. But even if you don’t see any damage in the attic, it’s the right time to check the roof. If you choose to do it yourself, be sure to employ every safety measure available to avoid the possibility of a fall injury. If not, hire a roofing professional to inspect it for you. Look for missing or broken shingles, misshapen areas of roofing, flashing around vents or chimneys in need of repair, and piles of leaves and debris that need to be removed. Check that the bricks on your chimney are in good condition and none are missing, damaged or ready to fall off. 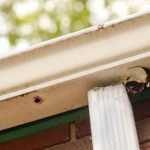 Gutters and Foundation – Spring often brings with it the heavy rains that usher in the green growth we enjoy until autumn. Check for leaks, misalignment of the gutters, and check the ends of the downspouts where the rain runs out. Be sure the water runs away from your foundation and isn’t pooling in one place. Check the areas of your foundation that are visible to you for major cracks and have a professional come in to repair any you find. Check foundation vents if your house has them and replace screening if needed, even if tears are tiny. Rodents and snakes can crawl through the smallest of these. 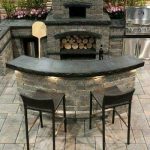 Did you know that you can call on Mike at D4 Construction to do all of this and more? He’s a highly experienced building contractor who can help you fix and maintain your home to ensure another year of great service to you and your family. Call Mike at D4 Construction in Kamloops at 250-572-4812 today. Driveway and Walkways – If your driveway is asphalt or cement, check it for cracks and tripping hazards. If you have weeds growing in the cracks of your driveway, there are a number of easy ways to rid yourself of them such as dousing them with vinegar or boiling water. If, on the other hand, your driveway is made up of gravel but you can see dirt and mud through it, you may need to have more gravel added to it. Same goes for walkways and areas beneath your windows that also might be covered in gravel. Exterior of the House – Whether your home is made of brick or stone, vinyl siding or cedar shakes, check all sides of your home for missing, chipped, or otherwise damaged sections. These need to be replaced immediately to avoid further (costlier) damage. Choose a sunny day to power wash the exterior of your house, as well as gutters and soffits. 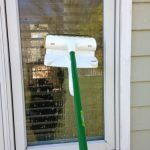 Power washing your home’s exterior will also clean the outside of your windows. Check window glass and seals, window casings, and you may even choose to wash the outside of your windows while doing so, if not power washing at this time. A bucket of soapy water and a hose can do the job in no time as you’re checking windows. Porches and Decks – A good cleaning may be all that’s necessary inside a screened porch, and if so, be sure to hose down the cement floor as well as the screens. Check the outside of any doors leading into the house for mold. A capful of bleach in a bucket of water will help here as you wipe them down (with gloves on, of course). Decks need to be checked both topside and underneath for any repairs that may be needed. Check all railings and steps for stability. Look for rotting wood and mold growth. Repair these things immediately to prevent potential accidents. If your deck is looking worn and weary but otherwise in good shape, consider staining or painting now for a spring update. 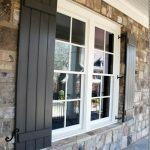 Shutters and Metal Hardware – Your shutters may have been black when you purchased your home, but after a few years of hot sun shining on them, you may not even have noticed how weathered and grey they’ve become. Same thing goes for the hardware on your garage door or outdoor lighting fixtures, so look at these with a critical eye. Plan to spend an afternoon removing them, laying them out on an old sheet on your lawn, and then spray painting them back to their former glory. Little fixes like these make a huge impact on your home’s curb appeal. This is a job that may only need to be done every few years. Doors, Outdoor Lights and Garage Door Opener – If you have a painted front door, be sure the paint isn’t peeling away. If so, lightly sand and repaint. Over-the-door hooks that hold your seasonal wreaths can scrape up the paint on your door, so be sure to check those areas and repaint if needed. If you have sconces on the exterior of your home and/or a hanging pendant light over your front door, clean the glass on these. Most likely you will need to remove them completely to do so. Carefully wash and dry the panes and replace. Even if you don’t do this every year, at least wipe clean the outside of this glass to make your lights sparkle and shine. Finally, check all bulbs. It’s amazing how we don’t notice bulbs burning out, especially if we turn lights on only after we’re inside for the night! If you have a remote control garage door opener with a keypad mounted outside of the garage door, replace the battery every few years – before you find yourself stranded in the driveway. Outdoor Utility Units – Before you turn on your air conditioning unit for upcoming warm weather, have a heating and air conditioning technician come inspect your unit. These HVAC specialists will do the equivalent of a car tune up for your air conditioner, replacing any parts needed and refilling fluids, carefully cleaning the unit and bringing it into service for another season. Check all other utility units on the outside, too. Check that they are free of debris and can be easily and safely accessed and serviced, cutting back brush and bushes if needed around these units. 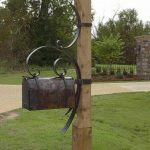 Post Boxes and Lamp Posts – The painted metal in your yard will start to crack and peel at some point. A little maintenance every few years may keep you from having to completely replace them. A good quality metal spray paint may be all you need, but if you see signs of rust and chipping, you may need to sand and prime them before repainting. If your vinyl house numbers are curling and coming off your post box, replace them with new ones after repainting. Yard – Late winter/early spring is a great time to trim your overgrown shrubs and foliage back. Clean up garden plots and prepare them for flowers or vegetables. You may choose to plant early spring bulbs around your post box if you didn’t do so in the fall. 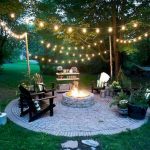 Solar lights at the base of trees or along walkways often become tilted and look messy if not straightened out; this is something that literally takes just a few minutes to straighten out for the season and makes a huge visual difference. Your bird feeders and birdhouses need a good cleaning at least once a year, too. Wearing gardening gloves, clean them out well and add some pine needles to the birdhouses if you want to welcome your spring residents. Fill bird feeders regularly if you enjoy birdwatching. If you have a cement bird bath in your yard, this too will need to be scrubbed and rinsed very well, then refilled with clean water. Other cement yard statues should be checked for mold and dirt at this time, too. Yard Furnishings – Outdoor cushions, pillows, furniture and rugs take a beating, so take a good look at them whether you’ve left them out during the entire year or stored them over the winter. Replace if needed. Be aware that the most economical time to buy these is at the end of each summer season, so mark your calendar to be on the lookout for bargains later on in the year for the following spring. Check the welcome mat outside your front door to be sure it looks clean and not shabby. 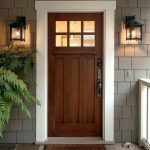 Replacing it is generally inexpensive and is often the first thing a guest sees at your front door. I recently visited a home where a piece of the plastic doorbell cover was broken off and there were cobwebs all over it, since the homeowners use the garage to enter and exit the home. It was obvious that they never checked the outside of their front porch area and I ended up just knocking loudly on the door. It made a terrible first impression on me. Two very small fixes could have easily avoided that situation. These are the fixups and routine maintenance you should be doing each spring. If you can’t get to all of it, try to stagger them and do half this year and the other half next year. For example, repainting shutters and garage door hardware is something you only need to do every two to three years, whereas checking the roof and gutters is a must every year to avoid larger repairs down the road. Additionally, you may find other things in need of your attention as you walk around your property. Fencing may need repair. Your outdoor grill could always use a good thorough cleaning at the start of the warm weather cooking season. Even large outdoor garbage pails could do with an annual cleaning using hot soapy water and a long-handled brush. You certainly know your home best – but for everyone, preventive measures are always beneficial to extending the functionality and beauty of your home. You may be able to do much or all of this yourself, but if not, Mike at D4 Construction in Kamloops can help you with your home’s spring fixup. Call him at 250-572-4812 today to make an appointment. And be sure to check back right here next month as we look at doing the same inside your home.